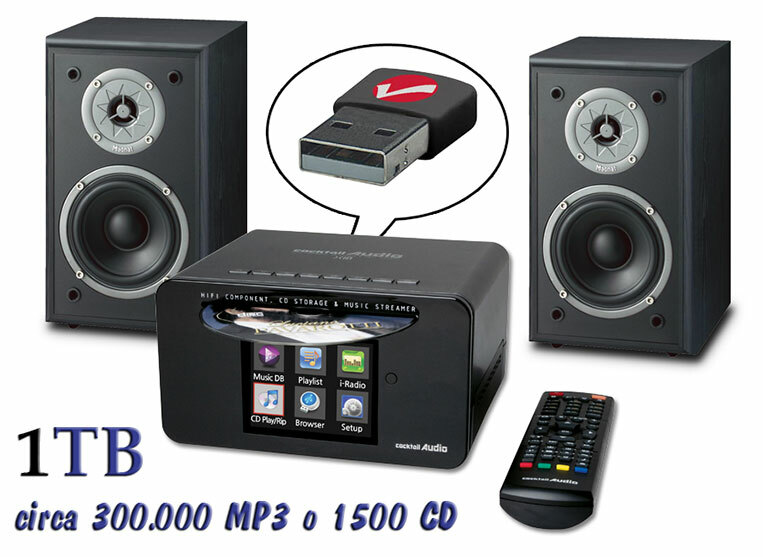 Includes CD player, it connects to the Internet for access to the database of mp3 music or to play audio networking. It is a powerful component hi-fi amplified 60 Watt characterized by modern and functional with color LCD for display of all functions. Thanks to the Hard disk 1TB included can store about 300,000 MP3s or 1,500 CDs. X10 Lettore, ripper, ampli multimediale di rete Black 352,00 -14,8% 299,99 € 1 pc. Monitor Supreme 100 Diffusori a 2 vie Black 98,81 -19,1% 79,95 € 1 pr. I-WL-USB-150 1T1R Wireless USB Adapter 150m Gray 12,90 € 1 pc. hd105si Hard Disk 1 TB (SATA 300, Spinpoint F3 EcoGreen) 69,95 € 1 pc.